The man behind the company, the product behind the man. The electronics we are talking about, manufactured by the Canadian firm Coincident Speaker Technology, has been an important part of my system for over a year now so I’m confident that I can give you an accurate analysis and well-informed opinion. Space is limited and I'd rather use it to talk about electronics so I’ll let you do your own research on the history of this company founded in 1993. You can visit the manufacturer's website for complete and detailed information. I just want to point out that it is a solid enterprise established twenty years ago, and it has a strong presence in the market today. Some mention is due to the sales policy, which is based on direct distribution from the manufacturer to the end customer. The benefits of this policy are clear when it comes to purchase price, but the downside is that you cannot listen to the components before buying them. One common feature in the high-end niche is that behind the brand and the company, there is a person. The man behind this company is Israel Blume, and he is personally responsible for the entire concept, design and development. He is surely one of a kind in the colorful world of high-end. He is very direct, frank, friendly, but with a touch of good-natured “grumpiness” at times. He certainly is a man with strong and distinct ideas. You will not find in his products that hint of “copy&paste” that often seeps into the multitude of items filling the high-end landscape. His ideas are clear and are a direct consequence of even clearer goals. There is little or no concession to compromise, even when this would mean the conquest of a potentially larger market. 1 - Being able to have a reasonable number of volume control steps before reaching high sound pressure levels. 2 - Being able to operate where these steps are usually closer to each other in a discretized attenuation system. Add to this, in the case of a classic potentiometer, the ability to operate where the tracking of the two channels is more linear. 3 - Simply said ... The preamp’s high gain , when paired with an equally high degree of power amp gain – connected to rather sensitive speakers - will raise the thermal noise to an annoying level and this will compromise the dynamic headroom of our system. Lastly, another useful feature of this preamp is that it comes with a ground lift switch. This is very useful when there are noise problems associated with ground loops. Let’s first take a brief look at how it presents itself, what it shows and also a little of what lies "under the hood". I have been asked to maintain confidentiality in the description of some of the circuit features (which is understandable), especially considering that these are unique solutions, and it would not be too difficult to copy them if disclosed. As the pictures show, there are two frames of unusual shape (25 cm L x 35 cm W x 20 cm H). The faceplates are classic brushed aluminum cast and the chassis is polished stainless steel sheet. The level of detail is very good, though I’m personally not crazy about the design (anyway, it is a highly subjective matter). As expected in one chassis there is the power supply (and what a power supply! I should say) while in the other chassis there is the heart of the linestage: the signal path. Between them is a rather rigid umbilical cord equipped with connectors with good safety lock screw. As mentioned, the first surprise comes when you see the front panel of the amplification chassis. What at first glance might be mistaken for the classic knobs used to control volume and input selection, are actually two independent volume control potentiometers. We’ll come back to the characteristics of the attenuator later. Continuing with our observation, there is only one toggle switch to select mute and another one to switch between the only two available inputs. The "obsession" for the lowest possible signal degradation leads this design to exclude any relays in the signal path in both input and output stages. Balancing can "theoretically" be done by separate adjustment of the volume for the two channels, but this regulation can be exploited to an acceptable degree only when operating in a range of attenuation whose steps are close together. Anyhow, I wouldn’t consider it a real option if you need good balance adjustment (excuse me, but does anybody still think that a good balance, if bad placement of the speakers make it necessary, can be achieved only through level adjustment without working on the time domain?). So we’ve seen the ergonomic limits of this little jewel, now let's briefly talk about its remarkable design. You might prefer to know how it sounds straightaway (or how it "doesn‘t sound"), but let’s give the devil his due. We have plenty of unique and refined solutions, and I promise that I will be brief. A glance at the project. 1 - Adjusting discrete - in 24 steps - transformer balanced volume control. 2 - "Special" - forgive the dreadful vagueness of the term - transformer coupling with the next and only active stage. 3 - Amplifying stage performed by a direct heating (DHT) single triode, to be precise the increasingly known 101D - chosen for its excellent qualities of linearity and transparency -. 3a - It is hardly necessary to mention the absence of any negative feedback loop. 3b - Elastic suspension of the triode 101D ceramic socket, to minimize/eliminate the effects of the well-known microphone vulnerability. 4 - Output transformer coupling. 1 - Exclusive use of Supermalloy signal transformers wired in "6N" copper and encapsulated with resin. These are also custom made in Japan. 2 - No capacitor or resistor in series with the signal. Superfluous, once again, pointing out the absence of any printed circuits. Everything is wired point-to-point with great skill and especially rare order (to protect the minimization of interference, resulting in maximization of silence). Well, we did our duty and described this particular "tool", at the service of our music experience. If you want to know more about the 101D tube, the web is always a good source of information. 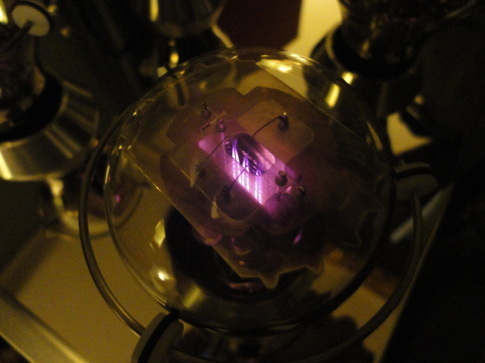 Just remember that the whole preamp - and essentially we are talking about transformers - was born and lives around this triode. Why do I stress this? Because the 101D has a natural tendency to slightly soften the bottom end despite its impressive transparency and absence of coloring. This is evidently compensated by the design of the preamplifier as practically no attenuation on the deep bass can be heard once you’re burned in the preamp and its many transformers, which is a rather long process. Storage/files player: music dedicated fanless server, Windows 8 pro O.S. and media player J-River WASAPI Event Style mode. Racks: Solid Tech Rack of Silence Reference Extreme, Music Tools. The system, as a whole, is not only able to reach the limit of the lower frequency spectrum but it can do so even at pressures that are, so to say, "generous". This makes the assessment of the full range of audible frequencies a merely analytical, spontaneous and natural exercise, and not an effort to the imagination or intuition. Added to this system, the Statement Linestage (line chassis positioned on a shelf suspended on springs and with Solid Tech "Feet of Silence” interposition), in some ways seems to hide so that it can perform the hard work while you’re not aware of its presence. But it can be spotted quite easily if you pay attention to details. For the way it looks you might expect - wrongly this time - color or tonal change that are easily identifiable and a predisposition to a certain range of frequencies more than others ... and again a certain background noise typically associated with direct heating triodes. But .. surprise! Preconceptions are debunked. Nothing is the way you expected it to be! I am not saying that they have to show you the tubes to make you aware they are there, but in many ways this is somehow true. The balance between the frequency ranges is flawless, no favoritism, no forward - or backward depending on your interpretation - for one portion of the spectrum over the other. The perception of transparency is very high. Statement Linestage in some ways does not play but lets the music lead the game. As mentioned, however, "flushing it out" can be rather simple, even if in a decidedly more indirect way. I got off the subject a little. We are not here to tell you about something that has been, but we want to highlight what Coincident offers today through comparisons with other components. Paradoxically - but not too much -, if the hybrid preamp represented, in our close examination, a sort of "Nemesis" towards the Coincident, the Viola Spirito II presents, on the contrary, many points in common despite the designs being so different. Both choose to impose their timbre as little as possible - the bypass test is always revealing -. Similarly, both preamps take extremely great care of the delicate microdynamics, not lacking at all in macrodynamic accuracy. The Viola Spirito II can be considered a benchmark if we talk about "silence" (and, people, the music is hidden in its silence), extreme ease of attacks and releases, polished fine detail and extraordinary focus of sound sources (I’ll leave the consequences up to you in terms of presence perceived). Going on in this comparison, I can say that the extension of low-frequency side of the Statement Linestage closely follows that of the Viola Spirito II; both of them are a little lean in the first octave with respect to the direct sound of source-> power amplifier. But when I say a little, believe me, I literally mean something so slight that it is hardly percievable. And at that level, even the forced introduction of an additional interconnect cable may move the sound that way. 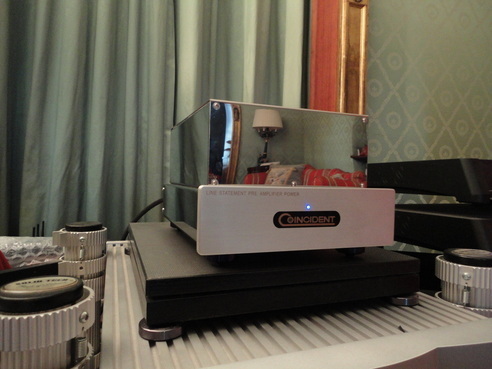 Nothing comparable to what is described above for the hybrid preamplifier. The frequency range and the linearity of the Linestage is therefore excellent. The top end is free from constraints, airy (even if that particular parameter is not perhaps the so-called "last word"), refined and well-integrated, like very few I've heard. 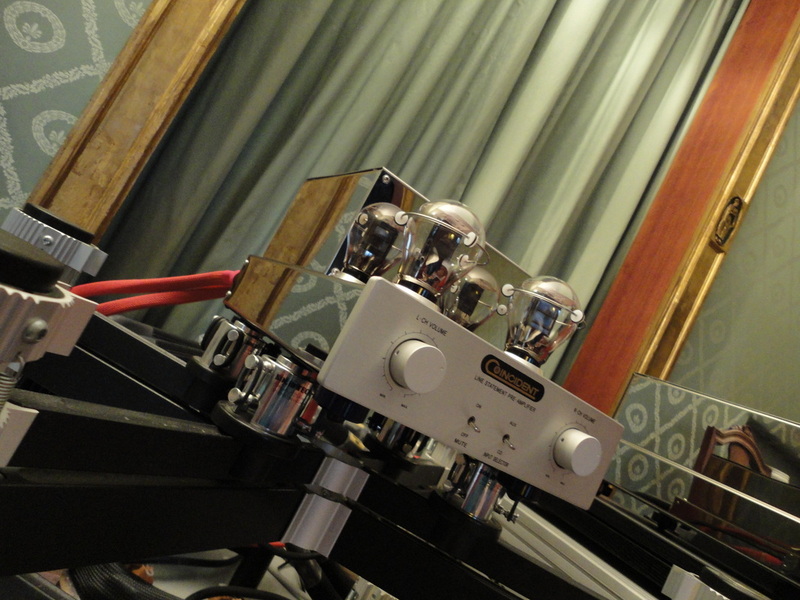 Again, compared to Viola Spirito II, the Coincident shares a very similar interpretation regarding the soundstage, both very different from the "king size", advanced and "immersive" presentation of the hybrid preamplifier. The Spirito II, as mentioned, proved its truly remarkable ability to focus sound sources, absolutely unattainable with the hybrid, and hardly reached by the Coincident. The Viola expressed an excellent sound with well-defined instruments following realistic proportions (where permitted by the recording of course) and without the magnifying glass effect, which can be appreciated or not. As a direct consequence of this extraordinary ability to focus the sound, the soundstage of the Viola reflected neither more nor less than what was supposedly in the recording, developing extensively 3D sound, without any sort spectacularization. Once limit I found was that the perception of the executors was less “solid”, “physical” compared to other top performers in that area. I could surely hear less focus from the hybrid preamplifier but a more "immersive" sound, in a wider soundstage (as a direct consequence of the much lower focus). Both performances have their fans and I can understand both preferences. Where does the Statement Linestage stand? Between the two, although much closer to the Spirito II than the hybrid. 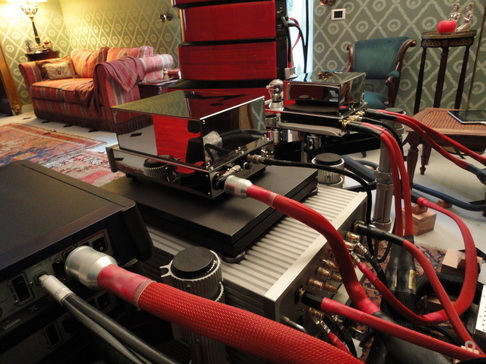 The level of focus doesn’t reach the "micrometric" precision of Viola's preamplifier of reference, on the other hand the tubes give a very refined and delicate sign of their presence in terms of a slightly greater physical and solid presence, and a more immediate perception of their volumes and a tonal palette extremely rich with nuances. The “last word” in terms of resolution at extremely low levels may still remain a Viola’s affair, but the Statement Linestage very, very close by. In both cases, we are basically at the top, though to note that the Statement Linestage is more prone to an "organic/holistic" presentation of the musical message (not that Viola is not ... the result is a quite unusual solid state), rather than fragmented and concentrated to enhance one feature or another. We are now getting closer to identifying/unmasking our Coincident Statement Linestage at last. Connect it and tonal variation will be at a minimum. Disconnect it and after a few minutes you'll probably (like me) jump nervously from one track to another; dissatisfied without knowing why. A few more minutes of dissatisfaction and I know what to do: I re-connect the preamp. The tone is "mine" (i.e. the one generated by the rest of the system), but it is clear that the direct connection source->amplifier shows a more "hectic" pace, almost a desire to unduly rush and scramble. To take away any doubt I remember my second weakness, the dear old "PRaT", and so I'll never be able to tolerate "sleepy" electronics. Coincident is nowhere near this. Here, the Statement Linestage, like the Viola Spirito II, is "simply" a great orchestra leader. It sets the pace with the balance and the naturalness I experienced in only a very few other great preamps. Its attacks know when they need to be quick, its steady hand knows when to show authority without ever being authoritarian. The complexity is admirable and the harmonic range (a second and extremely delicate triode presence?) is returned without any favored inclination in the spectrum. Another point that is worthy of praise is its successful effort to preserve and enlighten every sound source, even the lowest, until it naturally fades out. 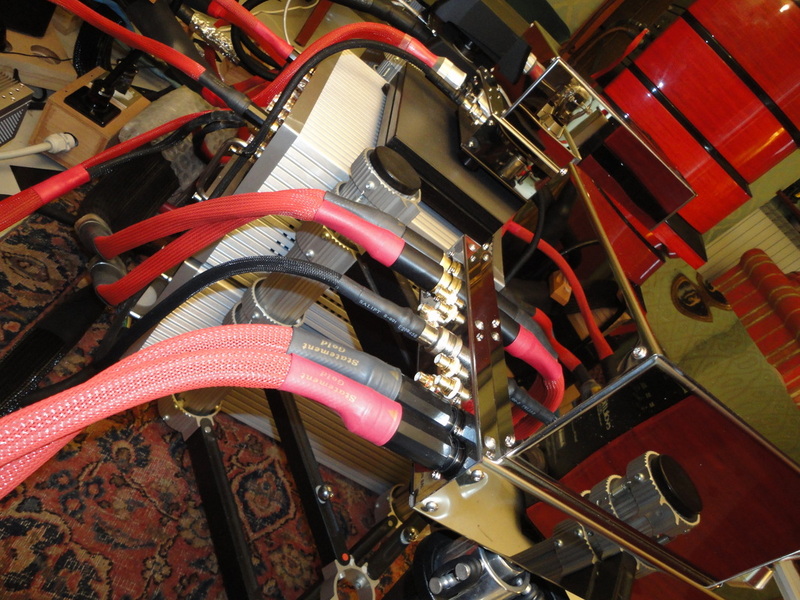 These details were polished out with great care, and they are always integrated in the body of the sound. It is all expressed with intrinsic naturalness and difficult to put words to. Not only will you tap your feet to the rhythm and your arms move like those of a director during an orchestra crescendo, but they will keep on moving for a long, long time. Natural emission and lack of any listening strain are easy lovers, you know. In contrast, the direct connection source->amplifier results in an unnatural frenzy, a kind of engulfment of micro-dynamics, swallowed by dominant macro dynamics. The result is a more "artificial" listening experience, in some ways more mechanical and less natural making it more tiring and unsatisfying. Reinserted the Statement Linestage, although the intention was to listen to the same tracks of reference for further A/B comparisons, I ended up hopelessly listening to entire records ... Again taken in by the music and its silences. Forgive me if I repeat myself, but the Statement Linestage is really very close to a perception of "non" sound with the objective of being at the service of your music, of tonal balance returned by your source of reference. It makes you forget the system and involves you in the message. It succeeds in doing this even though it's decidedly "high-fidelity" electronics that does not accept the compromise to embellish what is not beautiful. Well, I think I've finished with this far from complete fresco describing this very interesting electronic device. I do not consider it an assault limited to a specific type of preamp (tube rather than solid state or passive), but rather an assault on the role of high fidelity preamps altogether. I encourage you to listen to it at your local dealer's, but unfortunately this is not possible given their sales policy. Well, if I could I'd love to ask Israel Blume to maintain his policy of direct sales (with direct benefits in terms of quality/performance/price) but to arrange, if and where possible, a listening room for their products in each nation. That said, perhaps it is worth remembering that I compared the Coincident Statement Linestage, listed at $ 5,499, International shipping included (import costs and taxes excluded), with a $ 16,500 hybrid pre and a solid state - sublime - of nearly $ 50,000 (prices may not be updated). The latter use the usual distribution networks (i.e. with the possibility of trades, discounts, etc). In conclusion ... Are you looking for a preamplifier that at the touch of a button selects listening volume or source? Do you love computer music, so you don't have to get off the couch to change the record? Do you have several balanced sources to manage and want to do it all at once? Well, I'm afraid this is not the product for you then ... Unless you fall in love and decide to happily change your habits just "for him" ... this is exactly what happened to me. Dynamat Extreme ... placed everywhere but with common sense. Not recommended: for the time being replacing the 101D solid plate with the 101D mesh plate showed no improvement. I believe the reason is to be found in non-real "mesh" construction of the current 101D, which is made out to be a mesh plate but it is actually only a simple perforated plate. If there is any improvement in results, I will certainly report back to you.